When people collaborate amazing things happen. HOLA enables secure and fast collaboration across organization, making sure users don't step on each other's toes or accidentally destroy colleagues' work. 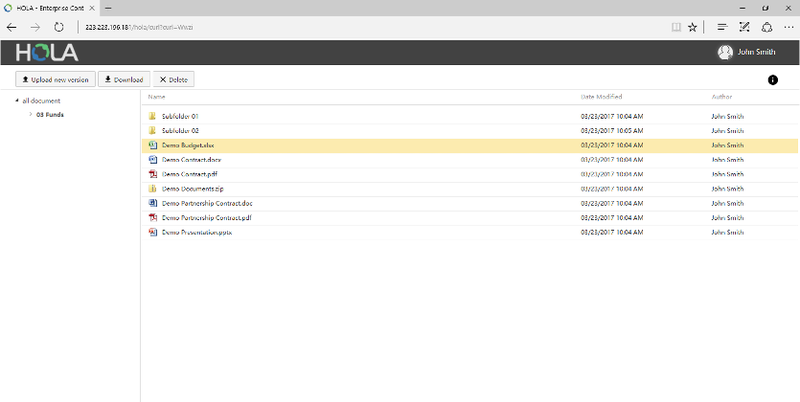 We also make very easy to securely share documents & folders with colleagues as well as non-HOLA users. Each document upload into HOLA system automatically creates new document version. Thus users working on same document can see different versions of same document uploaded by collaborating users together with modification time and revision notes. You can open, download, share and delete any document version found in document revisions. Obviously, access and any operation in document revision management is handled by HOLA's security. So users without proper security settings would not be able to see document version or perform any actions on them. Learn more about Security. There are times, when you are working on a certain document, but you don't want other users to upload new document versions, until you complete your work. In this scenario, you can lock specific document. When the document is locked, other users can still open it, read it and download it. However HOLA will not allow them to upload new document version, until the document is unlocked. The lock icon is also very helpful indicator that somebody else is currently working on the document. Select document or folder and click Share button. That's it. HOLA will generate share link and QR code for selected document. Now you can copy this link (or scan the QR code using your mobile phone) and send it to your colleagues by email, IM, post it on intranet, include it into another document or share it in any other way. When sharing folder, you are sharing all documents and subfolders inside the folder. When sharing document, you are by default sharing the latest document version. However, you can also share specific document version from Revision. When anybody clicks on a share link that was shared by you, they still need to login into HOLA to access the document. So if any unauthorized person gets access to your email or IM, they will not be able to access documents and folders via share links (as oppose to accessing them as email or IM attachments). Also over time, your email client & server will stay responsive as you are not creating cluter by storing huge amount of large email attachments in your email. After logging into HOLA, the HOLA security settings kick in, meaning that logged-in users will only be able to do what you allowed them to do. Read Security for more details. Share link is encoded in such a way, that it is not obvious if the link is document or folder, who or when it was created or what its name is. Sometimes you want to share document or folder with your customer or partner who is not a HOLA user. HOLA enables you to do this by providing you with Public share link feature. When you are creating public share link, you can specify if you want the link to be password protected or not, how long the public share link should be valid and what actions do you allow and in what quantities. Public share link can be setup for document as well as folder. Learn more about Security in HOLA. When you open HOLA share link you are presented with Document share link viewer or Folder share link viewer. These viewers will show you the content (document or folder) and provide you with limited set of actions you can do with the content. The limitation is defined by security settings. When working with other users on certain document, or sharing such document with your users or outsiders, you often want to have some sort of feedback. 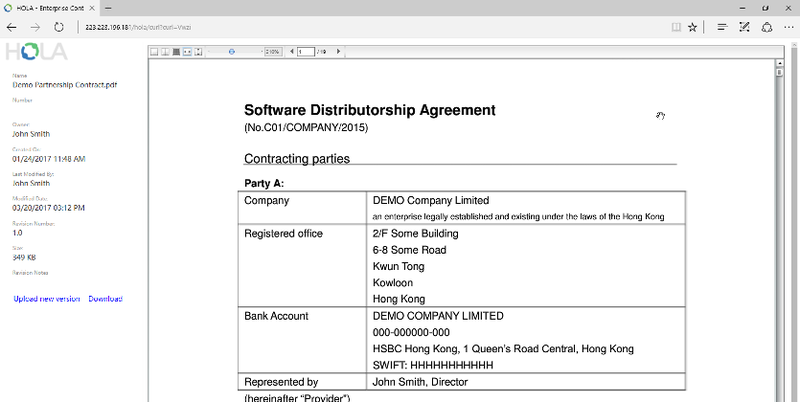 For example you want to know if your boss looked at the new version of contract you created and shared with him. You want to know if your sales team downloaded new redesigned sales presentation, or if your partners outside of your organization downloaded the release notes for your new product release. With HOLA it is very easy to get such information at glance. All you need to do is to go to document or folder you want to check and have a look at Access log. Collaboration and security are very tightly connected and related. You want your users to work together and to make sure they have access to all documents and information they need for their work. On the other hand, you want to protect your documents. You want to make sure that for example your employees don't see each others salary related information or that junior employess can't read, modify or delete documents designated for senior employees only. Learn more about HOLA security features.